• Not recommended for "short loops"
Those of you lusting after the latest HomePlug AV2 MIMO adapters have another alternative to ponder in the form of Comtrend's PG-9172 G.hn Powerline Adapter. Since this is our first G.hn product review, some background is in order. As the Wikipedia article notes, G.hn is the "common name for a home network technology family of standards developed under the International Telecommunication Union's Telecommunication Standardization sector (the ITU-T)". One of G.hn's primary differentiations from HomePlug is that G.hn is designed to operate over the three types of "existing" home wiring, i.e. power line, telephone and coax. (CAT5/6 isn't considered "existing", since if you had it, you wouldn't need G.hn!). Although both HomePlug and G.hn (and it seems every other modern communication method, most notably 802.11g/n/ac) use OFDM encoding, the lower level nitty-gritty prevent the two technologies from interoperating. So your HomePlug and G.hn adapters can't talk to each other. Since HomePlug AV2 uses frequencies from 1.8-86 MHz and G.hn occupies a band from 300 MHz to 2.6 GHz, the two technologies should leave each other alone and peacefully coexist. "The G.hn and HomePlug AV2 standards allow for coexistence. However, depending on the specific manufacturers implementation of AV2, there might be interference between the 2 different technologies and therefore, lowering overall performance when both devices are running on the same circuit." So your coexistence mileage may vary, and mine did, which I'll get into later. Like the latest round of HomePlug AV2 MIMO adapters including the ZyXEL PLA5405 and TRENDnet TPL-420E, Comtrend's PG-9172 is advertised as a "1200 Mbps" adapter. But, to save you the suspense, also like its AV2 MIMO cousins, its throughput doesn't come anywhere near the advertised maximum. 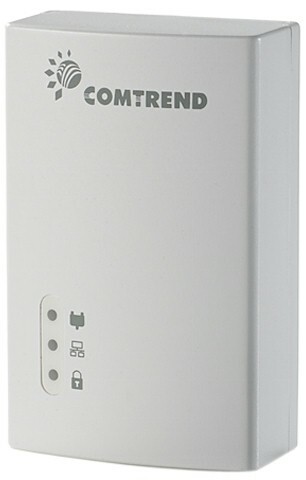 Comtrend sells the adapters individually and in a kit of two (PG-9172-KIT). Two individual adapters were sent for test, but I've entered the kit part number and pricing in the Powerline Charts and Finder for fairer price comparison to other listed powerline products, which are in kit-of-two form. The G.hn spec allows for up to 250 network nodes, but the PG-9172's data sheet specs "up to 8 nodes per network", while the product box says "up to 16 nodes per network". The PG-9172 is similar in size to other powerline adapters, measuring 3.7" x 2.4" x 1.4" / 93mm x 60mm x 35mm without including the plug prong depth. The photo below shows it won't block the adjacent outlet in a standard U.S. duplex. The serial number label specs a 100 - 240 VAC 50/60 Hz operating range. But I was concerned that the label lacked any electrical safety lab certifications (UL, ETL, VDE, etc.). Another concern is the product carries an FCC mark on the box and the spec sheet references FCC certification. But there is no FCC mark on the device. Comtrend's response was that "the product has passed UL pre-tests. UL Certification, though not required at time of shipment, is currently in process". The company also confirmed the PG-9172 is FCC certified and that they will "provide FCC ID details shortly". That will be interesting to see, since no other powerline adapter I've tested has an FCC ID. Comtrend sent an Attestation of Conformity certificate for CISPR Pub. 22 / FCC Part 15 Subpart B (unintentional radiators), which allows them to apply the FCC mark. I have seen this mark on all HomePlug products I've tested, but also without an FCC ID. This is because the FCC ID number isn't required on Subpart B products and you won't find the number in the FCC ID database. The callout diagram below shows a three light system, with Ethernet and powerline network indicators. The quick install guide description of the third light, Security, is confusing. It says G.hn adapters automatically connect in "non-secure" mode and instructs the user to press the Config button on each adapter you want securely connected. This would imply that the Security light is off by default. But all three lights glowed green when I just plugged in both adapters without pushing the Config button. My guess is that, like HomePlug, G.hn adapters connect with AES 128 bit encryption by default with a default password. And, like HomePlug, pushing the G.hn Config button is akin to pushing the Security button on HomePlug adapters, i.e. it changes the key so that factory-default adapters won't connect to your network. In either case, data is AES 128 encrypted. The spec sheet also states "Power-saving mode when inactive", but I couldn't find any documentation describing how it works. I plugged the adapter pair in and didn't connect anything to either Ethernet jack and both Connection and Security indicators remained lit even after 30 minutes. There are two major G.hn chipset vendors, Marvell and Sigma Designs. The PG-9172 uses Marvell's G.hn solution, which has separate baseband and analog front end devices. Marvell's device uses MIMO via the power outlet ground pin, just as HomePlug AV2 MIMO adapters do. The photo below shows the board top, showing RAM and both Marvell G.hn devices. Key components are summarized in Table 1. The board bottom photo shows the 8 MB flash memory on the left and the Marvell 88E1510 Gigabit Ethernet PHY on the right. The plastic case has no ventilation holes at all and gets moderately warm, even when idle.